I thought I heard the voice of God. It wasn’t. No matter how much I wanted it to be, it wasn’t. It’s not that I didn’t ask. I did. It was in my prayers daily. But I already knew. I knew what I was doing was not God-approved. I’d read the Bible. I knew what it said. The words of the Bible couldn’t be any plainer. I kept asking, though, trying to convince myself that God didn’t mind, that he was perfectly fine with my choices. I tried to convince myself not only that my choices were not contrary to God’s will but that they were well within his desire for my life. I knew what was real, but I didn’t want to deal with reality. I was like one of the people God spoke of in Isaiah 29:13. My heart was on my desire, not on my Savior. No matter how much I tried to convince myself that God must approve – else why would I have such strong desires – I couldn’t get around the fact that the Bible clearly prohibited what I wanted, and what I did to get what I wanted. What changed? Not my understanding. That had already been set. I understood that what I was doing was wrong, but I wanted it so badly I did it anyway. No amount of convincing was going to keep me from pursuing that desire. So what changed? The desire itself. One day I desired the sin. The next day I didn’t. God took the desire from me. That was the answer to my prayer: “God, if this isn’t your will please let me know.” It turns out I didn’t understand the prayer, but the Spirit did. The answer to the prayer was to change the desire within me. I’m glad God answers prayer, even when it’s not the prayer I thought I was praying. This entry was posted in Uncategorized and tagged heart's desire, Holy Spirit, Jim Croce, prayer, Sin. Bookmark the permalink. That’s amazing that God took that desire from you, Tim. That doesn’t always happen — often the desire remains, we indulge it, and we reap the consequences. God was (is!) so merciful. Perhaps the fact that you stayed connected with him, even in an imperfect way, allowed it to happen. Good point, Jeannie. I think it’s an instance of the Holy Spirit not letting go, despite what I thought I wanted. He’s the one who kept me connected throughout. He concluded that he was completely confident that “Mrs. Custis . . . will have her armor, and she will wear it well.” Always makes me smile. What a wonderful eulogy for Mrs. Custis. I like the parallel quotes, very effective. repeating, we have all been fooled, and we learn from those errors. This has been my experience as well. There are many things I desired which I would rationalize, knowing they were sinful desires. The Lord doesn’t answer my first prayer. Or my second. Or, sometimes, my 100th. As long as there is *any* shred of denial, rationalization, “justification,” or defense of my sinful desire, it remains…like a burning ember that rises up from a fire and inconveniently places itself just under your shirt collar. Stinging…begging you to twist, to scratch. ONLY when I fully embrace that “I *know* this is wrong. I’m done defending it” step have any of my sinful desires (and I have an addictive enough personality that there was a pretty long list, many of which remain) been removed from my shoulders. He makes us perfect in our *weakness*…when we’re utterly spent. When we’re all done trying to hide it from Him or defy Him over it, or even to try to get rid of it without Him. *That’s* when we finally call out to Him *honestly*…and then He answers faithfully, with joy that we’ve finally let Him *in*. Or at least that has been *my* experience. “I’m done defending it” – That is the way I feel whenever he has taken the desire from me. I am just plain done. Such a blessing. So…it’s interesting that you knew what you were doing was not pleasing to God, yet you kept coming back to God in prayer. 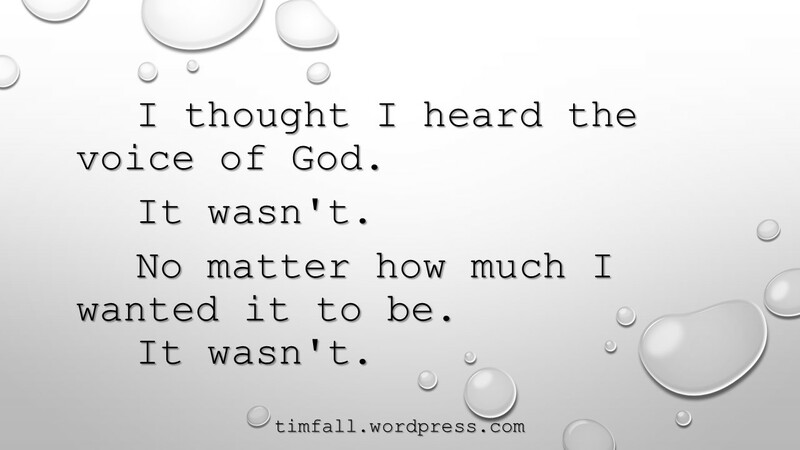 To me, that doesn’t sound like you falsely thought you heard the voice of God. It sounds like you knew the voice you were following was not God’s voice. You knew it was your own desire in opposition to God’s will. And the really cool part is that, knowing your will was in opposition to God’s, you still kept coming back, asking for His will in your life…because you really, truly, did want relationship with Him. You were hoping He would change his will to conform to yours. Instead, he changed your will to conform to His. Excellent post, Tim! Very thought provoking. You’ve got on the process I was describing in the post. I like the post you linked too. Shared it on Twitter.